[ADVERT]Matt Moran's Aria was awarded two chef's hats by The Sydney Morning Herald Good Food Guide in 2012, and I'm not at all surprised why. Only last month I paid Moran's other restaurant Chiswick (which was awarded one hat) a visit on my birthday, where I had a wonderful dining experience. As part of Sydney Festival, Aria offered a truncated menu of two courses and a glass of wine for $55 at pre-theatre hours. Normally you'd be spending that amount on just a single main dish. Now the downside is that we were only able to pick from two entrees and two mains. But it didn't even matter, because every single dish was beautiful. With million dollar views of the Sydney Opera House, Aria has snagged a pretty decent spot. I arrive with Captain Adventure at 6pm on a Sunday evening. We're given complimentary bread - I have a slice of rye with caraway seeds, which is delightful and reminds me of the bread I used to eat as a child in Germany. 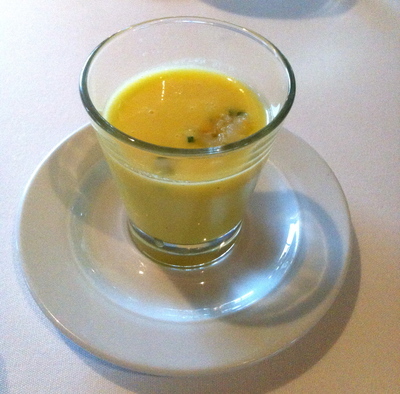 This is followed by an amuse bouche of chilled sweet corn and prawn. Fresh, crisp and somewhat unexpected because of its coldness, we're off to a great start. 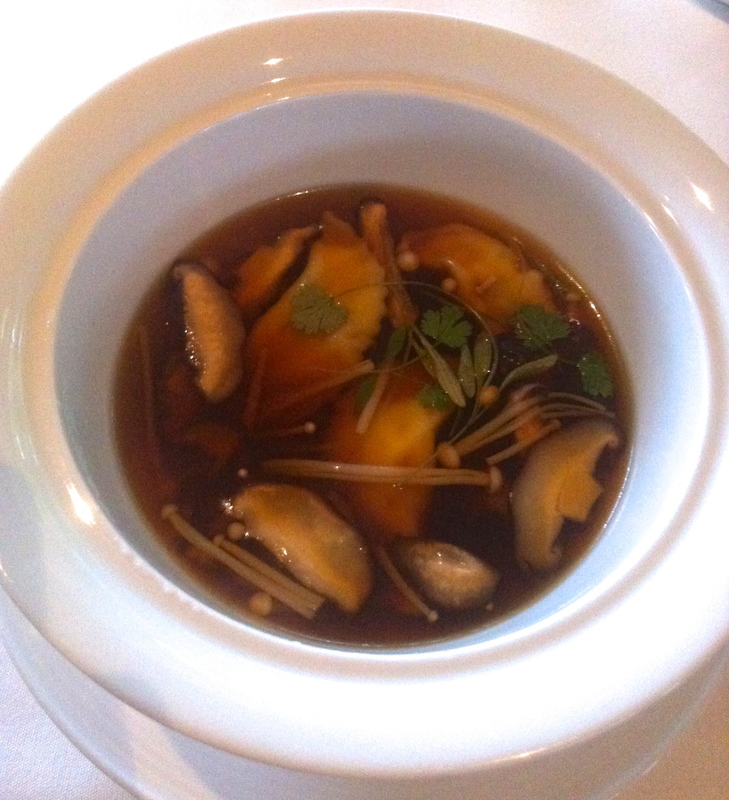 I choose the Peking duck consommé with duck dumplings, shaved abalone and mushrooms. Swimming in the wonderfully aromatic broth are three soft dumplings filled with duck, shaved abalone, shiitake mushrooms and enoki mushrooms. The fragrant, earthy consommé is lifted with a few sprigs of fresh coriander. The consommé is divine but so full on that I don't end up finishing it. 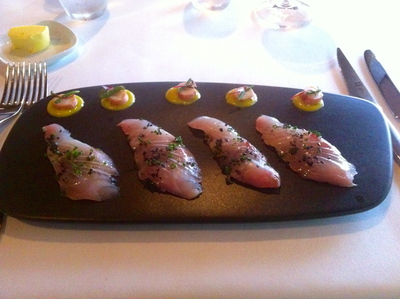 Captain Adventure opts for the sashimi of kampachi with pickled octopus, volcanic salt, samphire and a basil and mango sauce. The volcanic salt adds bite and a huge hit of saltiness. The flavours are paired well and the presentation is elegant. For the main, Captain Adventure has the char grilled sirloin with white asparagus, minted peas, salsa verde and garlic chips. The beef is cooked exceptionally well, counterbalanced with the fresh salsa verde. 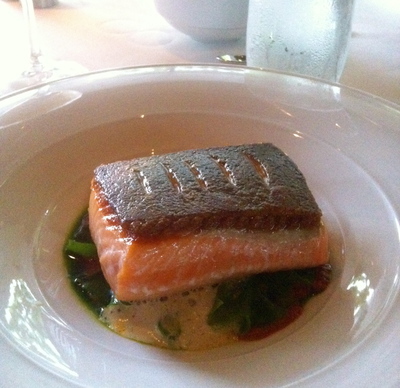 My seared king salmon fillet has a beautiful crispy skin and rests on a bed of herb farfalle, white asparagus and tomato fondue. The farfalle are delicate and vibrantly green. I've always loved their bow shape, which is the main reason farfalle are my favourite pasta. 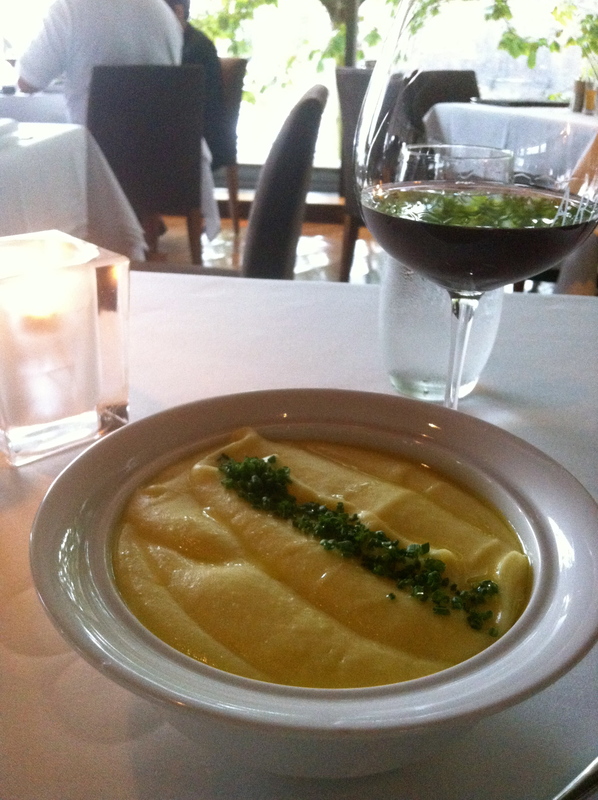 I'm also a huge fan of white asparagus, so I'm quite taken by its addition to the dish. We also order the truffle potato mash ($15) as a side. And wow, am I glad that we do. I'm a notorious potato-lover, so when I say this mash is all kinds of amazing, I'm not exaggerating. It's so buttery and creamy that you almost need a spoon to scoop up the truffle-laden potato deliciousness. Despite my enormous love of potatoes, even I couldn't finish that bottomless bowl of mash. We then receive a set of petits fours – Turkish delights, sesame snaps, and Baileys and coffee truffles. I've never been one to enjoy Turkish delights because I feel like I'm munching on a bouquet of roses, but Captain Adventure gobbles mine up. The sesame snaps are crunchy and sweet. And the truffles have a lovely, creamy Baileys and coffee centre. 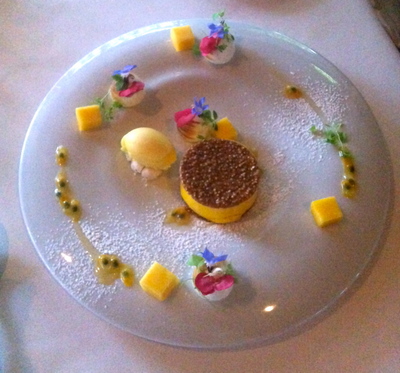 For dessert the two of us share the mango mousse wedged between quinoa tuiles. Small peaks of Italian meringue are adorned with edible flowers (and a few herb sprigs, which look pretty but don't quite work flavour-wise). There's a delightfully sour passionfruit sorbet on top of fragments of meringue, luscious cubes of fresh mango as well as a scattering of passionfruit pulp. 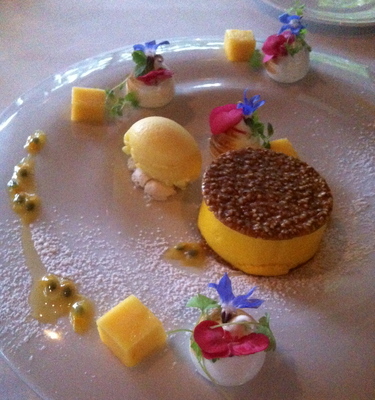 Aside from the gorgeous plating, this is a perfectly balanced dessert. Sour meets sweet, crunchy meets smooth, and colours meet flavours. All in all, I was very impressed by our meal at Aria. 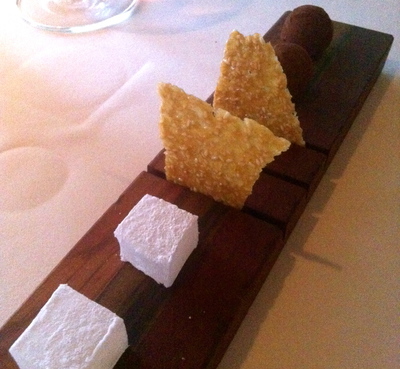 Next time I'll up my game and go for the degustation. great dinner you had. 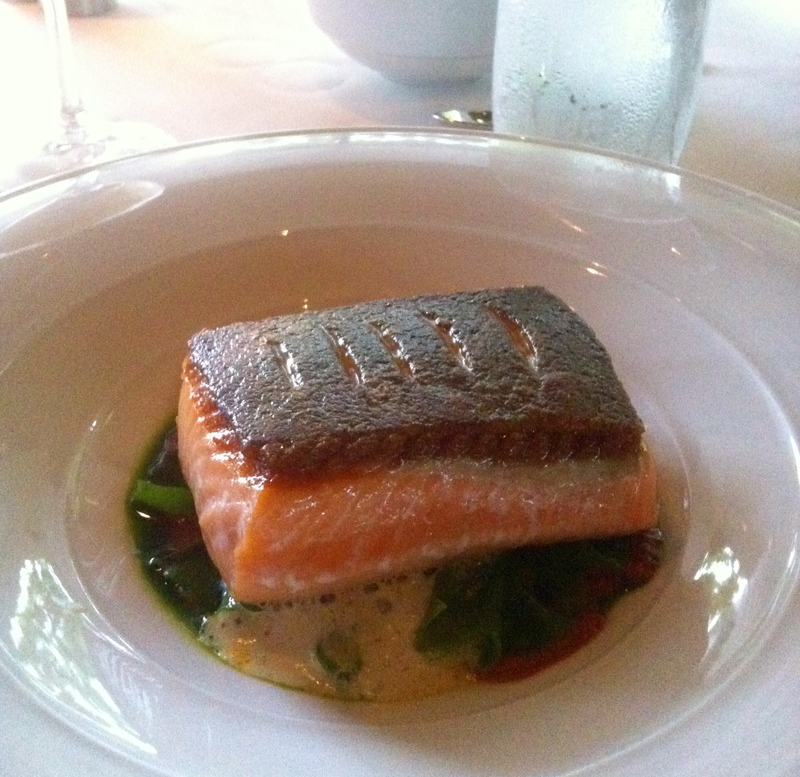 wish I was there now..
very inreresting, especially the salmon & potato mash.